How to Beat the Casino? Pink Casino is the self-proclaimed leading online casino in the UK dedicated to offering ladies casino services. Pink Casino was established in the year 2012 and is owned by Intellectual Property and Software Ltd (IP&S). It has a dual license; one issued by Alderney and the other issued by the UK Gambling Commission. It is a sister casino to Casino Euro Millions, Slotaway Casino, Bet UK, 21 Casino, and Castle Jackpot Casino. Despite being an online casino developed for ladies, there is no need of proofing your gender when signing up at the site. Its pink theme gives the first impression of a lady’s casino, but anyone can sign up with the site. In fact, Pink Casino is a bona fide taco fest for any male gambler. Before going into the pink casino reviews on the casino games, it’s worth mentioning that Pink Casino missed a real trick by failing to offer Playtech’s famous Pink Panther slots game as one of the games. Moreover, its failure to include Piggy Riches and choosing to include its less-celebrated cousin, the Piggy Payout is another miss. That aside, the casino chose to have their casino games to be powered by IGT. There is nothing wrong with IGT, but with the funds and a customer base that the sister casinos have, IGT could have been replaced by other big online casino software developers such as Microgaming, Playtech or NetEnt. They, however, do have a handful of Microgaming casino games such as Game of Thrones and Avalon. For ladies who enjoy playing table games, they will find it frustrating to play the games offered here. The site has only EIGHT versions of roulette, four versions of Blackjack and a game of Craps and Baccarat each. Video poker is also not featured like it is supposed to be featured at any online casino with only six versions of this online casino game being offered here. Pink Online Casino also offers live casino services. It has various live online casino games such as Baccarat, Poker, Roulette, and Blackjack. If you like the feel of a real land-based casino, there is no need to put on a tuxedo and travel to a casino. Instead, you should just sign up with Pink Casino, pull your chair to the online casino and get ready to be transported to the world of sophistication, elegance and live casino gambling. Through the live casino services, you will be able to play roulette, blackjack, baccarat and Hold ‘Em Poker as you read what the other online casino players are doing in the various poker rooms. Before starting to play for real money, you can practice. The Pink Casino reviews online are worth mentioning in this review. The reviews, mostly given by real players, have indicated that the online casinos lack in commitment to ensure that their customers are satisfied. They, for example, have featured and complained at how the Pink Online casino customer support service is languishing at ensuring they have the necessary help. Moreover, other players have been complaining about how they have to wait for days before they can receive their bonuses or withdraw their cash. Below are some of the comments taken from random websites online. 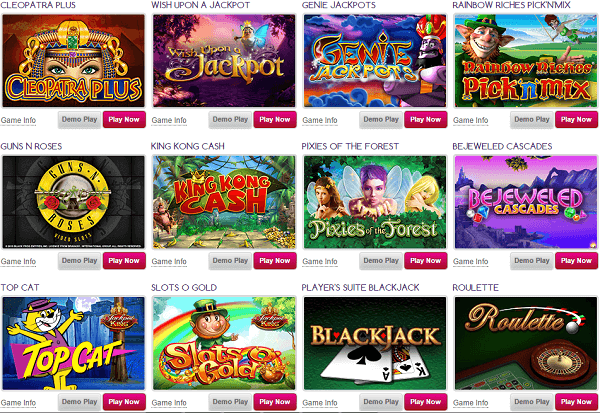 Pink Casino has a few online casino promotions for its new and regular players. For example, they have the £10 free no deposit bonus that they give away to their new members. They also have the 100% cash match welcome bonus up to a maximum of £150. In addition to the welcome bonuses, Pink Casino has the midweek balance booster where you are awarded a 50% deposit match up to a maximum of £50. They also have a promotion promoting their new casino slot game, “the fruit factory gadget race.” By playing this slot game, you increase your chances of winning cash prizes. Lastly, Pink Casino has something for the VIP members. It has the VIP club where members have a chance of receiving exclusive VIP treatment, including reload bonuses, cashback, and lavish promotions. Not so many banking options are available at Pink Casino. At the site, you only get to use your Visa Electron, Maestro, Master Card and Visa Debit to make deposits and withdrawals. The minimum deposit at the site is €10 on the lower side and a maximum of €1,000 on the higher side. At the time of writing this review, I tried to contact the customer support on the minimum and maximum withdrawal limit but wasn’t successful. However, I made a deposit of €50 and withdrawing from the account through the Visa Card took almost five days to receive the cash. Pink Casino is powered by IGT, one of the oldest and known online casino software provider. However, it does have a few other online casino games that are powered by Microgaming. The casino games are flash supported, meaning you can play them on your mobile device without having to download the mobile application. Pink Casino has had more negative reviews as compared to the positive reviews. For instance, the online casino does not have any eWallet option in its banking services. This means that you will have to stick strictly to the Visa Card, Master Card, and Maestro options when making your deposit and withdrawals. Additionally, they have a dormancy clause, which includes seizing your account after 2 years. What makes this a bad thing is the fact that they don’t give any prior warning of closing your account. They also have a condition that it will pay out all its jackpots in 20 annual installments. When you compare this to other online casinos, Pink Casino scores lowly and discourages players from playing at the site. 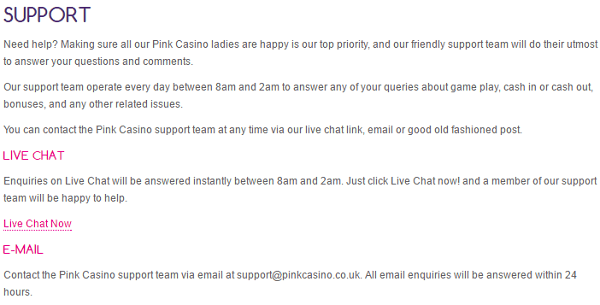 On the positive side, Pink Casino should be applauded for using the approach that is likely to aggravate both genders.